Rail bridge over the I-405 Freeway looking west on Florence Avenue. Crenshaw/LAX Rail Bridge over the I-405 freeway at Florence Avenue. 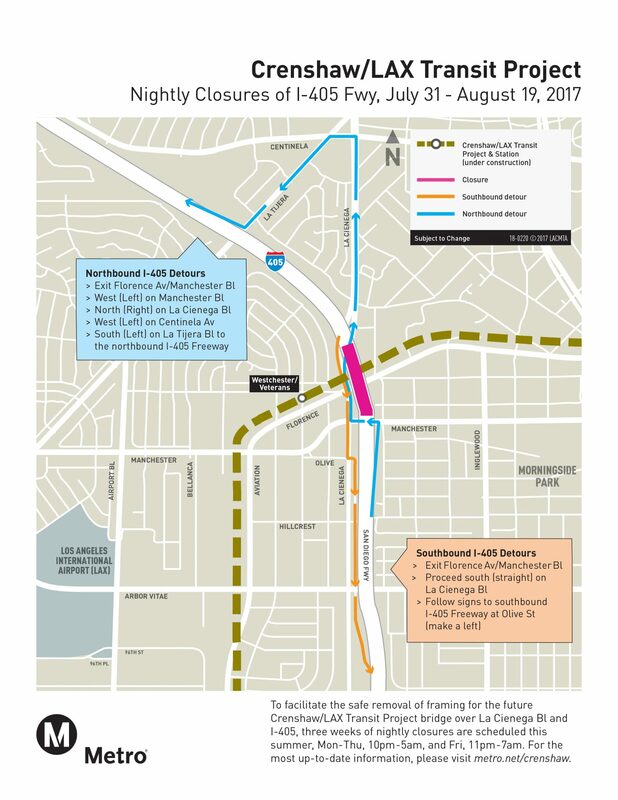 Fifteen nights of full and partial closures on the I-405 freeway will begin Monday, July 31, to accommodate construction of a bridge for the Crenshaw/LAX Line. The work is being done by Walsh Shea Corridor Constructors, the contractor building the project for Metro. If traveling northbound, exit at the Florence/Manchester off-ramp, turn left (west) on Manchester, turn right (north) on La Cienega, then left on Centinela and then left on La Tijera and continue to the northbound 405 on-ramp. Closure dates are tentative and subject to change based on construction progress and weather conditions. The bridge is expected to be completed in 2018 and the Crenshaw/LAX Line to open in fall 2019. LAX encourages passengers to arrive at their terminal two hour before boarding time for domestic flights and three hours before boarding time for international departures. Metro apologize for the inconvenience that these nightly closures may cause and urges motorists to plan ahead and to expect some delays. Another possible detour southbound to LAX would be to exit the 405 earlier on the Howard Hughes Parkway, and take the first left on Sepulveda. The turnoff for the airport is just after you pass the north runway (where it joins with Lincoln Blvd). (1) There is no southbound 405 offramp to La Cienega. five different southbound 405 offramps provide access to La Cienega (Florence/Manchester, Century west, Century east, Imperial, El Segundo). (2) It is physically impossible for the south 405 to be closed from ANY of those offramps to La Tijera, which is encounter BEFORE one encounters any of the ramps that can access La Cienega (but which are not marked La Cienega). (3) Your map shows the southbound closure will not start at La Tijera, like your copy infers. It says the closure will start at Florence/Manchester and end just south of Manchester. La cienega exit pases under the bridge that they are working wont this exit also be affected by the construction.